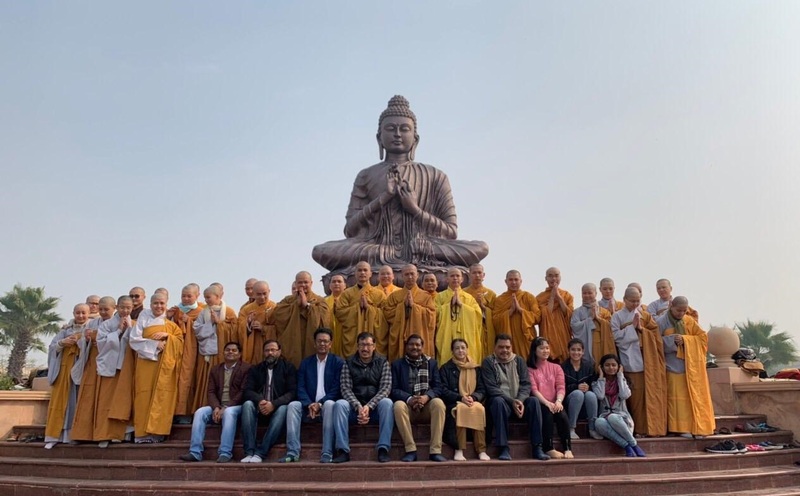 Greater Noida (05/02/2019) : Today Vietnamese students along with their local friends celebrated “Tet Nguyen Dan” or Vietnamese New Year at Gautam Budha University. Tet Nguyen Dan is considered as the biggest and most popular festival of Vietnam which usually celebrated on the first day of the first month in Lunar Calendar. Tet’s celebration is the longest holiday which may last up to seven to nine days. Vietnamese New Year in 2019 will last from 4 -10 Feb 2019. Today as the first day of its celebration all the Monks and Nuns gathered at the Buddha statue and offered a special prayer and chanted mantras. During this faculty member of the school of Buddhist Studies and Civilization were present and celebrated the festival along with the Vietnamese Monks and Nuns and also wished them a very happy and academically fruitful year ahead.